A lovely Red Sonja cosplayer. 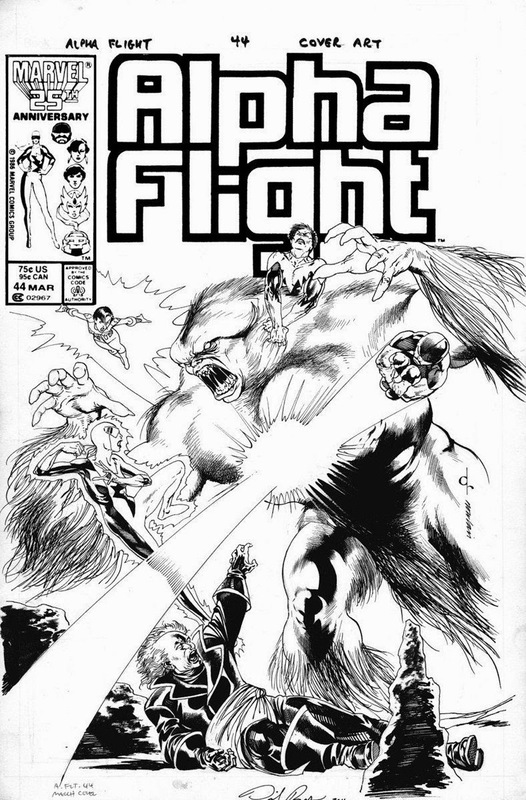 In the second entry of Alpha's Beta Flight we continue our review of John Byrne's second year on the book. After killing the team's leader Guardian back in #12, Alpha was in need of a new leader... so, let's get to it, eh? Well, ain't that a fine how do you do? 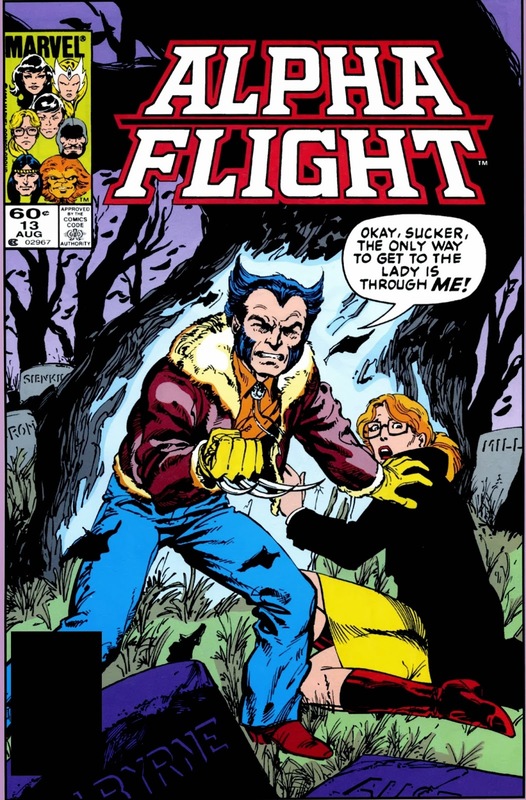 It's hard to imagine the average readers' response when they bought the December 1984 issue of Alpha Flight only to find out about half of it was actually a reprint of X-Men I#109, cover dated February, 1978. Well folks, at least Byrne sort of warned you on the cover. Nowadays, the idea of reprinting about 10 pages of material half a decade old and selling it at premium prices would be unheard of. And yes, sixty cents is still money, especially by 1984 standards but consider this: 30+ years ago, the average, young comics fan only had the far from complete back issue bins to get the complete story. There weren't that many comic book stores around and the internet, where the entire backstory of anyone is but a mouse click away, was still very much a pipedream. In those days Marvel didn't really collect or reprint material. If you came to the party late, you simpy missed the boat. 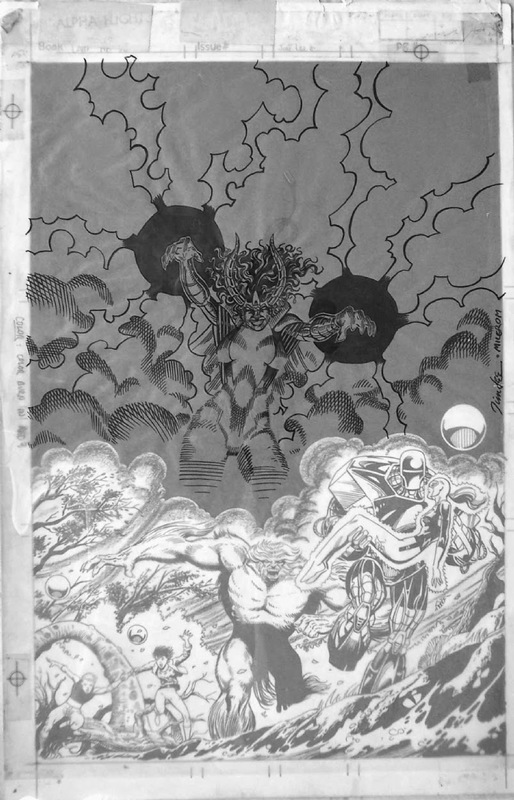 Reprinting X-Men I#109 must have been a more than welcome treat to most mutant fans who came in after the 1980 Dark Phoenix saga that really put the mutants on the map. 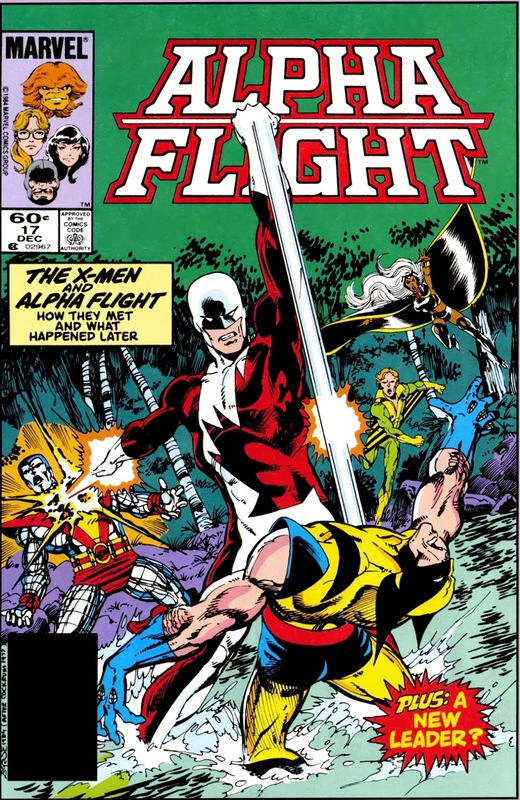 And Alpha Flight I#17 was the indirect template for the hugely succesful Classic X-Men, which debuted in September of 1986. The formula was deceptively simple: take an old issue and expand on it by adding pages and subplots to it based on current continuity. John Byrne did exactly that when he used Alpha Flihgt I#17 to tell Guardian's part of the story featured in that old 1978 X-Men issue. 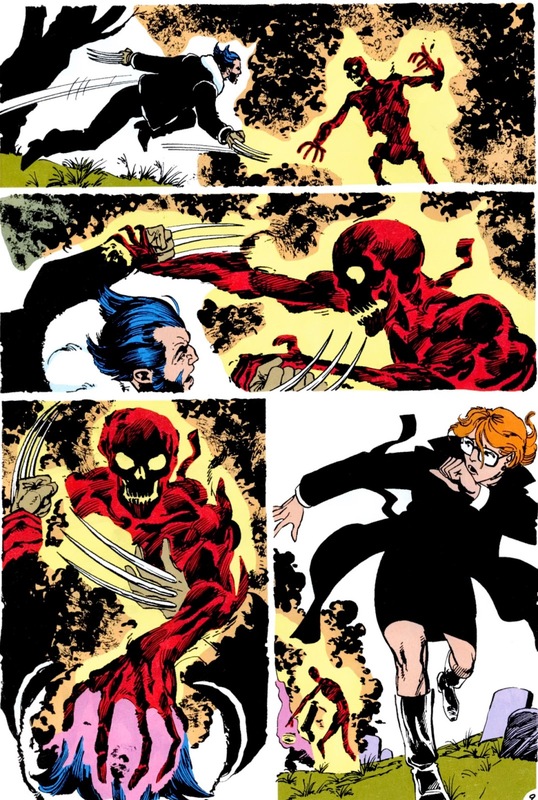 Byrne cleverly framed it as a shared memory between Wolverine and Heather, the widow of James Hudson who fought the X-Men in order to get Wolverine back. Canada's just not the kind of country that breeds world-conquering types"
Well James, that's just dandy. Do try and tell that to the Great Beasts, not to mention the Master of the friggin' World. Still, this early piece of dialogue shows how naive Hudson was. 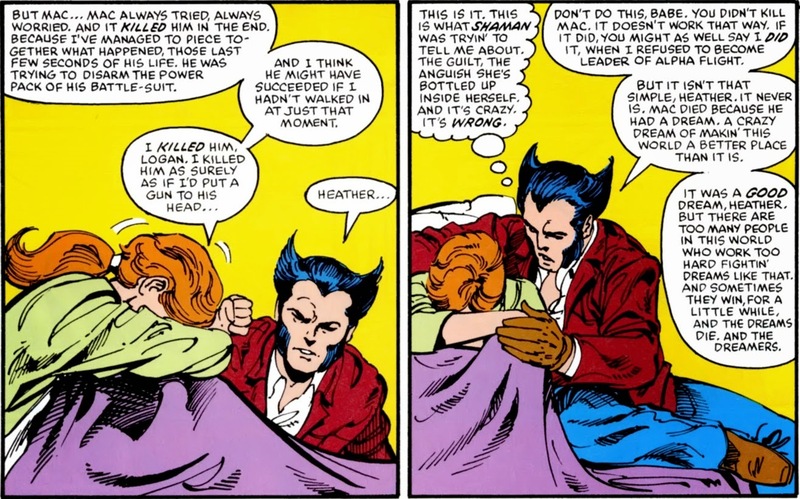 And, as Heather and Wolverine continue their talk, the subject inadvertently turns to the incident that killed Guardian... and Heather's unexpected breakdown. "I killed him, Logan. 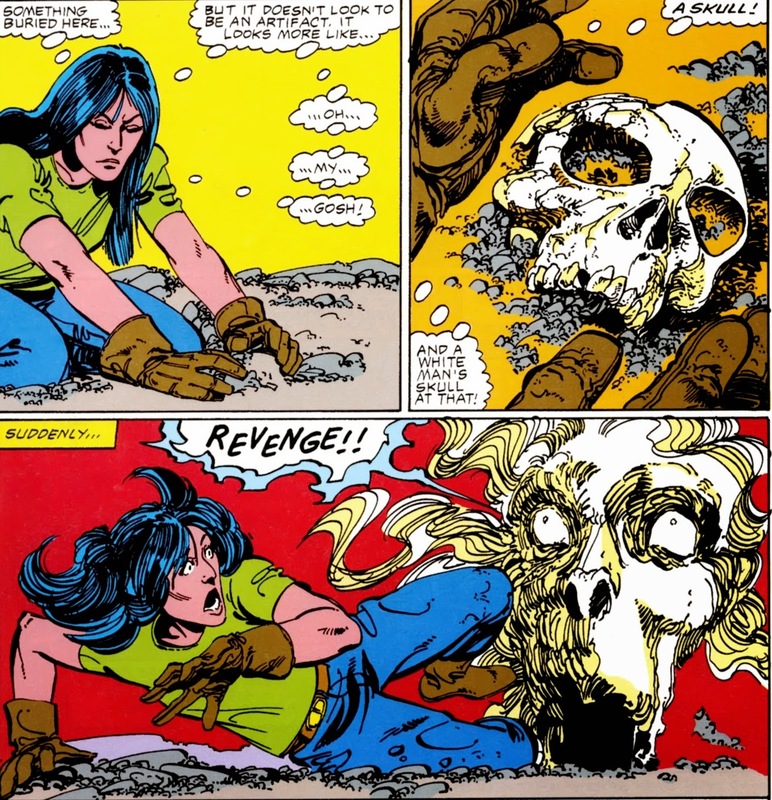 I killed him as surely as I'd put a gun to his head"
"Last rites for Alpha Flight." However, two midgets pushing the centennial mark were ultimately successful in convincing Heather her husband's dream was still worth fighting for. After carefully considering all the possible candidates for leadership, Heather finally settled on the one, obvious candidate... despite the fact she didn't have any powers, skills or leadership experiences to speak of. "I WILL BE THAT LEADER!" And while Heather's promotion as a non super powered leader of a superhero team should be at least noteworthy and unique in the anals of Marveldom... 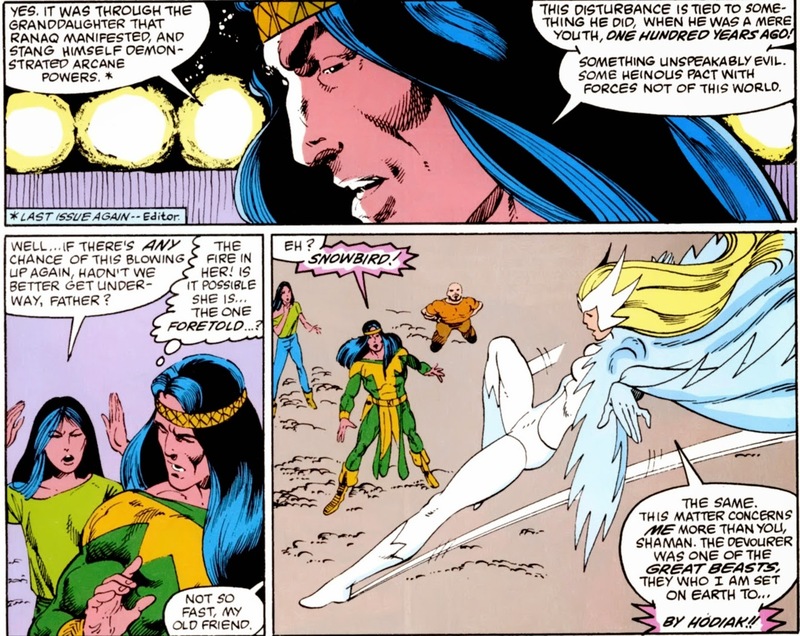 In the exact same month New Defenders writer Peter B. Gillis promoted Angel's girlfriend Candy Southern in #138, making her the non-team's leader and chief executive officer. Talk about timing. 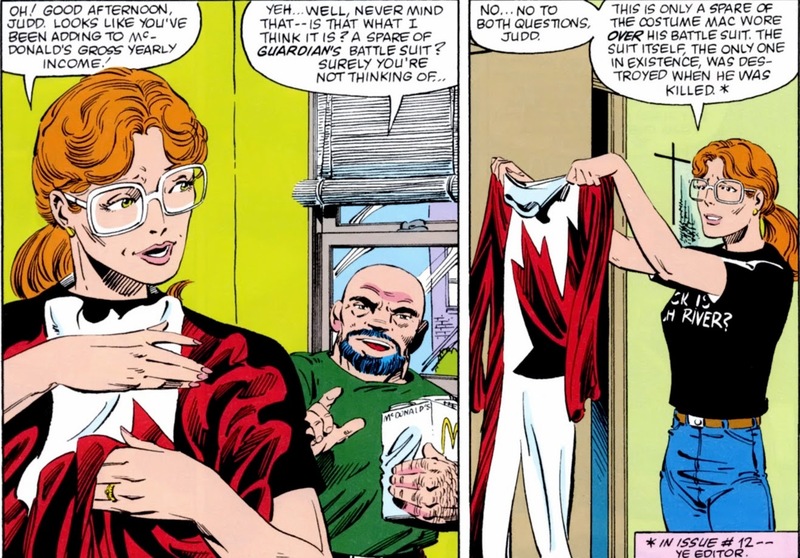 But while Candy was content to parade around in Jane Fonda style hotpants, Heather was considering far more serious attire, as we found out in the opening pages of Alpha Flight I#18. Is she ready to become an active Alphan and jump into the fray using her late husband's combat gear? "No... No to both questions, Judd"
Thanks for answering Heather, though that's not my name. Also... 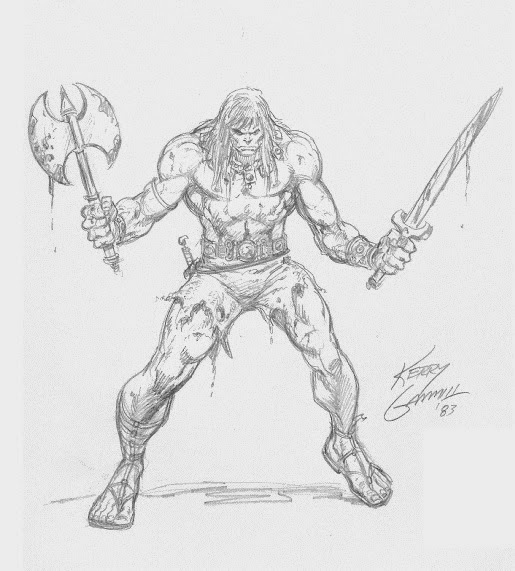 Guess nobody bothered to tell Bill Mantlo, because he'll have you in that armor within 6 months of taking over the book. Still, for now, Heather's only trying on the empty suit on for nostalgia's sake. Probably in much the same way she's still wearing her wedding ring. But fair's fair: as leader she was far more concerned with the nuts and bolts of the superhero business. Acting on her background as an executive secretary Heather was determined to reorganize the Flight into a more structured organization. She set out to contact Alphans left and right, but only managed to get a hold of Northstar who was at his home in Quebec enjoying some downtime. And no, there's no gay subtext to this scene at all. No, really... There's a girl there too, right? I have no further motivation for continuing my association with Alpha..."
"You said it might hurt a little..."
Guess I spoke too soon, eh? In between issues, Byrne turned Langkowski into a typical Marvel scientist, whose field of expertise magically happens to suit whatever the story calls for. In much the same way Hank Pym started out as an expert on ants but eventually wound up inventing Ultron, the unstoppable adamantium killing machine. In Langkowski's case, the former radiation expert added molecular physicist/mad scientist to his resume. 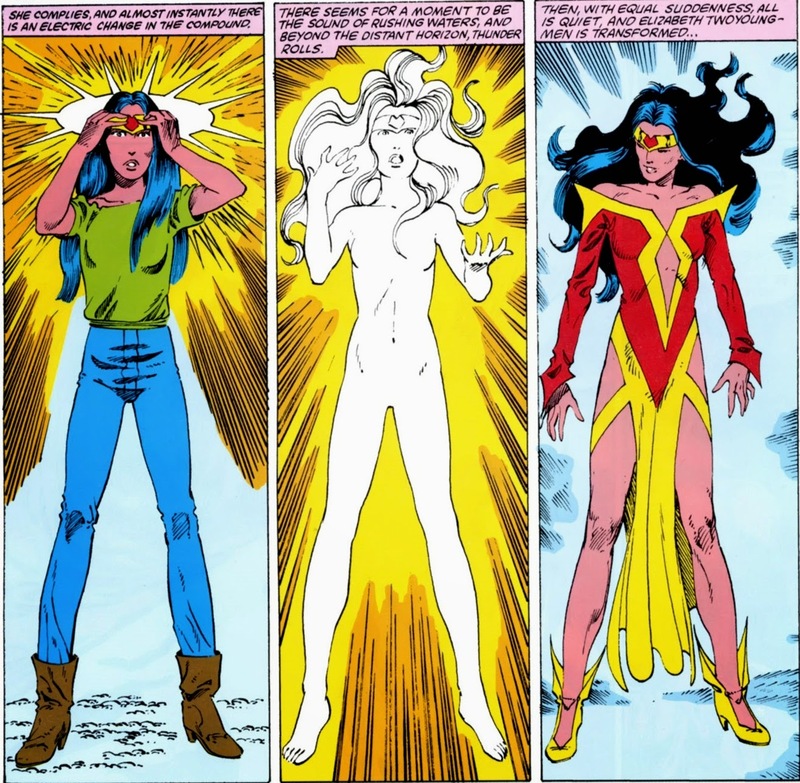 Upon Aurora's request, he used an experimental technique to rearrange her molecules making her distinctly different from her monozygotic brother Northstar while still retaining her powers. Why anyone would want to go through with this is beyond insane... But hey, that's Aurora for ya. Langkowski's reasons for going through with this are far more sinister. He wanted to break up the tight bond between Northstar and Aurora, figuring he'd have her all to himself then. A pretty twisted, manipulative move, though he rationalizes it by figuring he actually did her a favor. 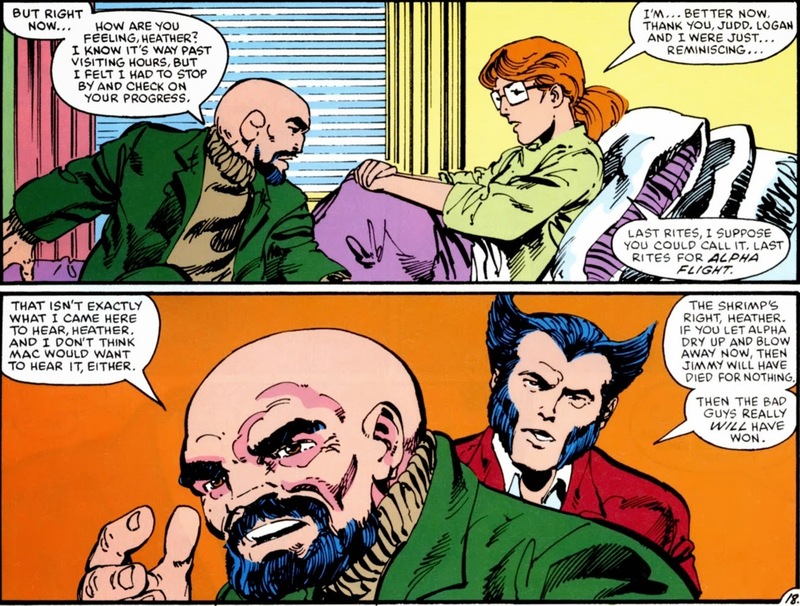 Mutants are a persecuted minority after all, so by altering her genetic structure she's technically not a mutant anymore and should be safe... You're welcome. Yeah, and Aurora's supposed to be the nutty one. Speaking of terrible doctors, Heather couldn't reach Shaman either. Michael Twoyoungmen was contacted by his daughter Elizabeth to help her investigate the mysterious entity that popped out of the skull she'd dug up an issue or two earlier. "Well, Shaman, is it yea or nay?" The "weird monster" she mentions was actually a plate of scrambled eggs gone mad. 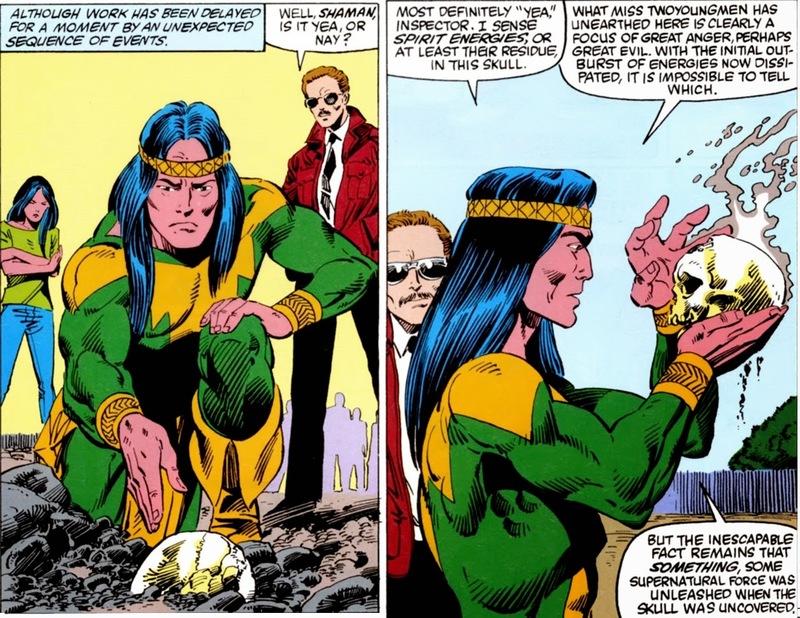 Yes, while his American counterpart Doctor Strange regularly faces down cosmic entities and outerdimensional hordes, Shaman's main claim to fame was fighting off a handful of unfertilized embryos. And what's worse, he only won because his daughter suddenly developed mystical powers of her own. Yes, once again Michael Twoyoungmen puts the 'shame' in Shaman. At any rate, shoving the Ranaq possessed breakfast food down his medicine bag didn't completely defeat the Devourer. 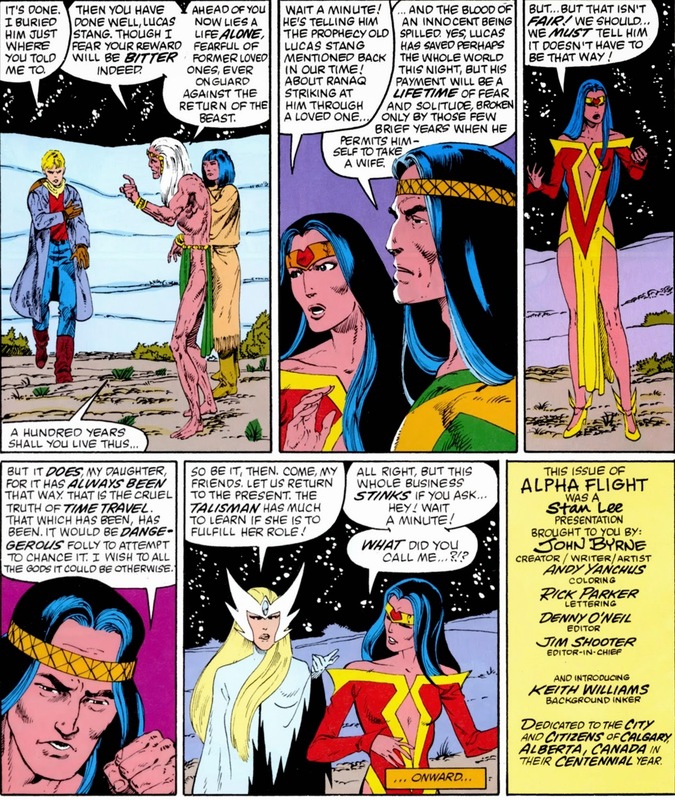 In fact, Shaman concluded that Alpha Flight needed to return to the past to deal with Ranaq once and for all. That's why he summoned Puck and Heather to Calgary... because when you're attempting time travel all you need for backup are a midget and a powerless woman still recuperating from crippling leg injuries. "Not so fast, my old friend." "Hail to thee, o promised one. Thy unworthy servants bids thee welcome and awaits thy least command!" Having Snowbird bow down in awe of Elizabeth was all the proof Shaman needed that his daughter was destined for greatness. Of course, you'd assume all parents think of their children that way. But then again, if your last name is "Twoyoungmen" and all you get is a girl, all bets are off. Still, without even taking a minute to explain to her what's at stake, Shaman insisted his daughter reached into his pouch to search for something called the coronet of enchantment. Elizabeth complies, even looks into the bag (which is supposed to drive everyone but Shaman insane) to find the headpiece and puts it on. For now and forever, Elizabeth Twoyoungmen is Talisman, named after the talisman of power she wears on her forehead... And will be for the rest of her life because the headband doesn't come off. Shaman already knew this, but neglected to tell her. It's like beating the proverbial dead horse by now, but Shaman really is terrible at everything remotely close to doing the right thing. "There is no time for explanations now, my daughter. You have just received a great gift, it must be put quickly to use." 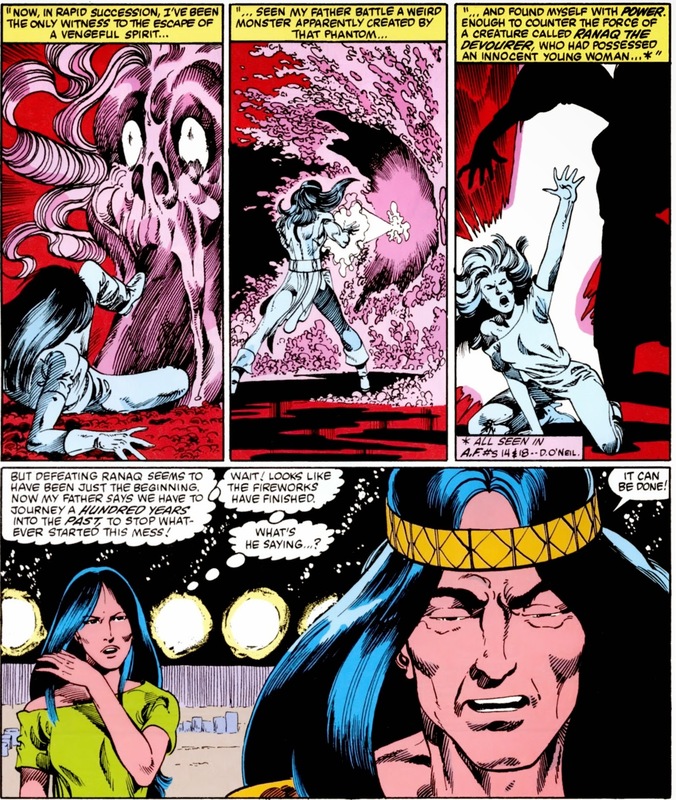 Yup, ten seconds after changing his daughter into a mystical being, Shaman is ordering her to go back a hundred years to face a demonic menace. 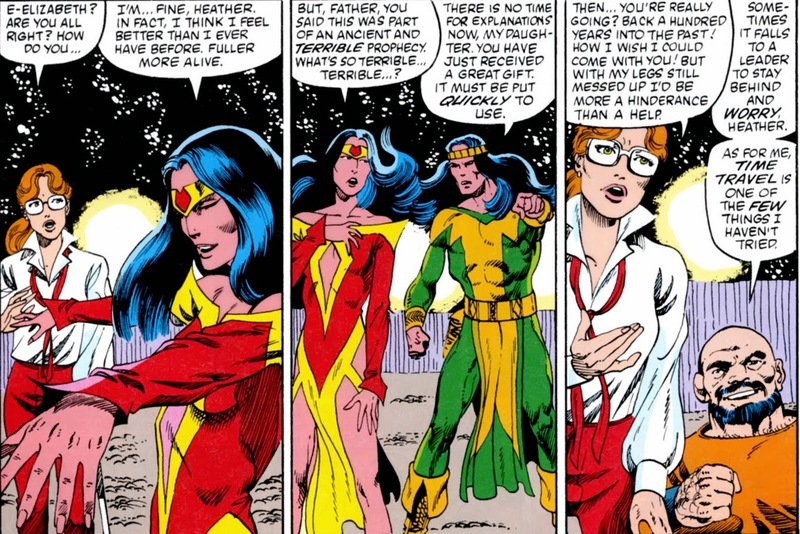 Now thát's fast... Heck, even Professor Xavier allowed Jean Grey at least a chance to say hi to the other X-Men before he shoved her into a uniform to go fight Magneto back in X-Men I#1. 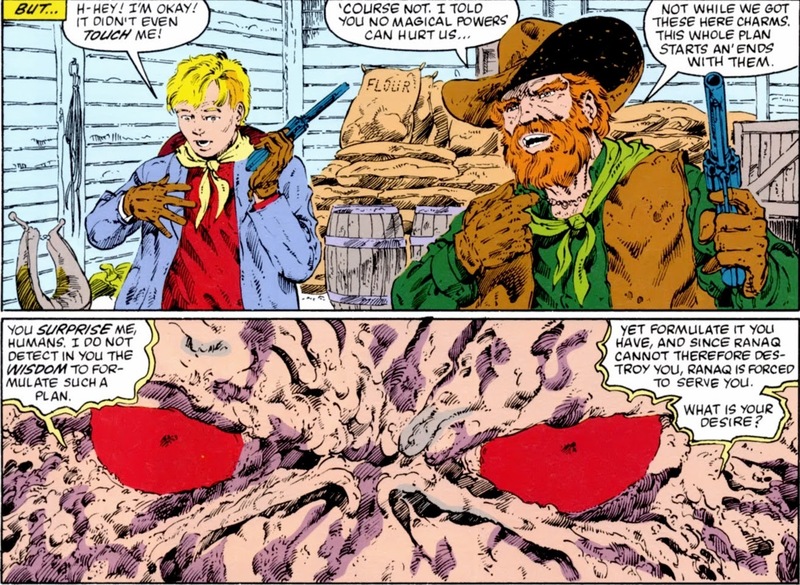 So off they went, back in time to discover the origins of the Ranaq possessed skull that wound up buried in Calgary. In a dazzling display of competency, Shaman manages to disguise the Alphans as they search the newly founded fronteer town for clues. They soon hit paydirt when they spot two cowboys, Zeb and Lucas, threatening an old Native mystic. Zeb wants the man to summon Ranaq, who he believes to be a wish granting genie of sorts... and they're even protected from the demon's powers thanks to some convenient magic charms. "Since Ranaq cannot destroy you, Ranaq is forced to serve you. Much like the genie he's unfavorably compared to, Ranaq is a shifty one. He happily complies with Zeb's very predictable wishes, conjuring up gold, jewels and even a gorgeous woman from thin air. However, when Zeke goes to claim his prizes they might as well be thin air... The amulet that protects him from Ranaq's wrath also prevents him from actually touching any of his prizes. "Zeb... I don't think this is such a good idea..."
Famous last words, but the damage was already done. Ranaq had managed to trick Zeb into getting himself possessed by the Devourer's essence. Now, with a human host, Ranaq could really do some damage. 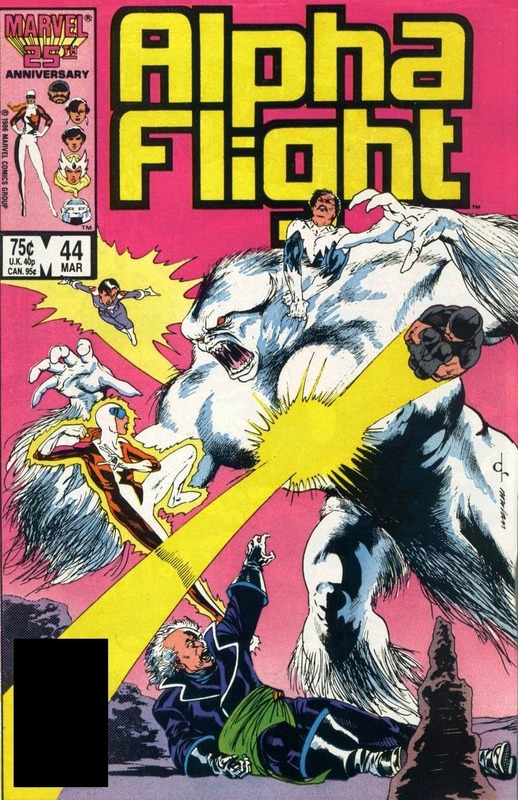 Luckily, Alpha Flight was on hand. "Truly, there is more to this than I had even begun to guess!!" Ow Michael, at this point you should have that on your business cards. Following Ranaq's rather rigorous exorcism, the body of Zeb is buried in the exact same spot Elizabeth Twoyoungmen would unearth it a 100 years later. A time paradox prevented (though this reads more like a time loop), the Alphans prepare to return to their own time... but not before learning that even in victory there sometimes really aren't any winners. For instance, young Luke (or rather Lucas Stang) was in for a hundred years of miserable loneliness. He wasn't allowed to experience any kind of joy or know love, or else Ranaq might return. Of course it's too graphic for a Comics Code approved book, but wouldn't you have put a bullet in your head if you knew you were in for a century of misery? Also... Elizabeth Twoyoungmen is stuck with that outfit and the equally clunky codename Talisman. But more on that plus a bevvy of female villainy in part III of Alpha's Beta Flight: I Sing Of Pink Pearls and Lillies Gilded. It’s big and beautiful and filled with late 1970s and 1980s goodness! and includes adaptations of Star Wars and Empire Strikes Back. 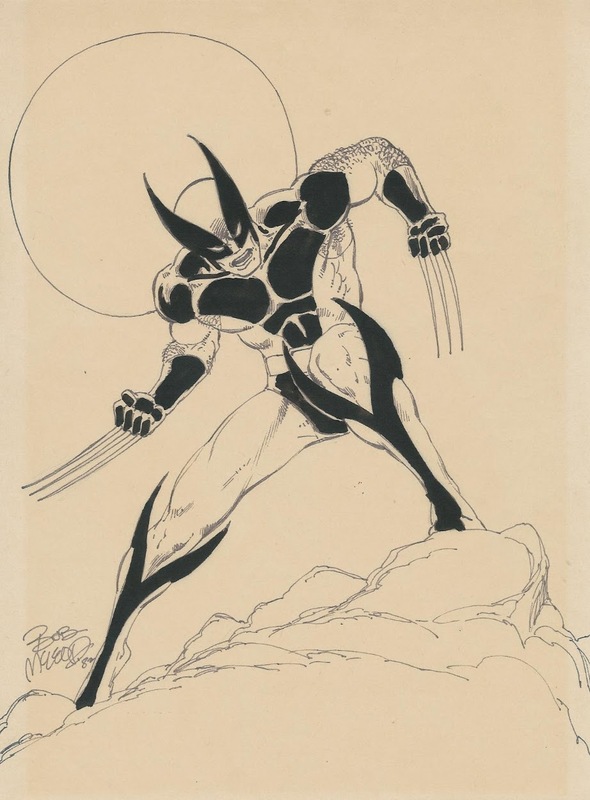 Marvel also included a lot of nice extra material like unpublished covers and original art. 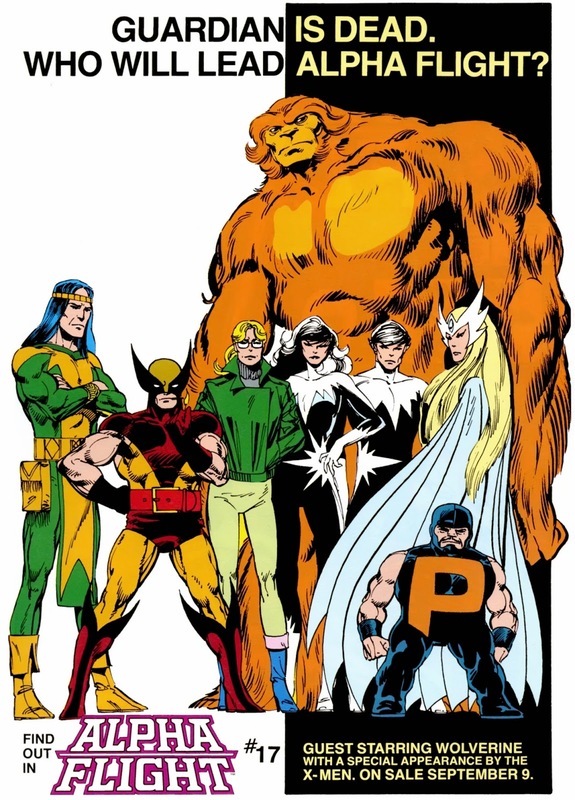 John Byrne survived his first year on Alpha Flight and the same could be said for almost the entire team. After killing off Alpha's leader Guardian, what would Byrne do for an encore? Well, a lot... Most of it unexpected, as we'll find out in Alpha's Beta Flight. "Okay sucker, the only way to get to the lady is through ME!" Ah, Byrne... always a true, if not slightly cynical visionary. It would be years before Marvel would shamelessly plaster their most popular characters on the covers of low selling books to boost sales. Well, that could have gone beter. Of course, this is all a dream. Or rather a nightmare, one Heather Hudson's been having for about a month now following the tragic events in New York. She's been staying with Puck and Shaman who try their best to help Heather pick up the pieces of her life. And there's plenty of pieces to pick up. "I'm still uneasy about the way you chose to deal with Smart Alec." Yup, Shaman is keeping the miniaturized, mindless body of his enemy inside the pouch that drove the man insane to begin with... Because he feels that is the most efficient method of caring for him. While it's certainly true that this way he can be fed with a few breadcrumbs a day while the waste he produces is negligible... Michael Twoyoungmen is also a medical doctor, he took the Hippocratic Oath... Y'know, the "first do no harm" thing. Deciding that shrinking down comatose patients and carrying them around in your purse is preferable over getting them to a hospital for proper medical care is one of many signs that Shaman really is a terrible doctor. Just ask his daughter Elizabeth who still can't forgive him for promising to cure her mother, only to have her die...But we'll get to her in a bit. Puck and Shaman later accompany Heather to meet with Alpha's old government liaison Gary Cody who is stunned to hear of Guardian's death... but is also quick to point out he really can't do anything to help her. Even though Heather had hoped Mac's time with the government might provide some sort of financial cushioning, perhaps even a pension... She's completely on her own. 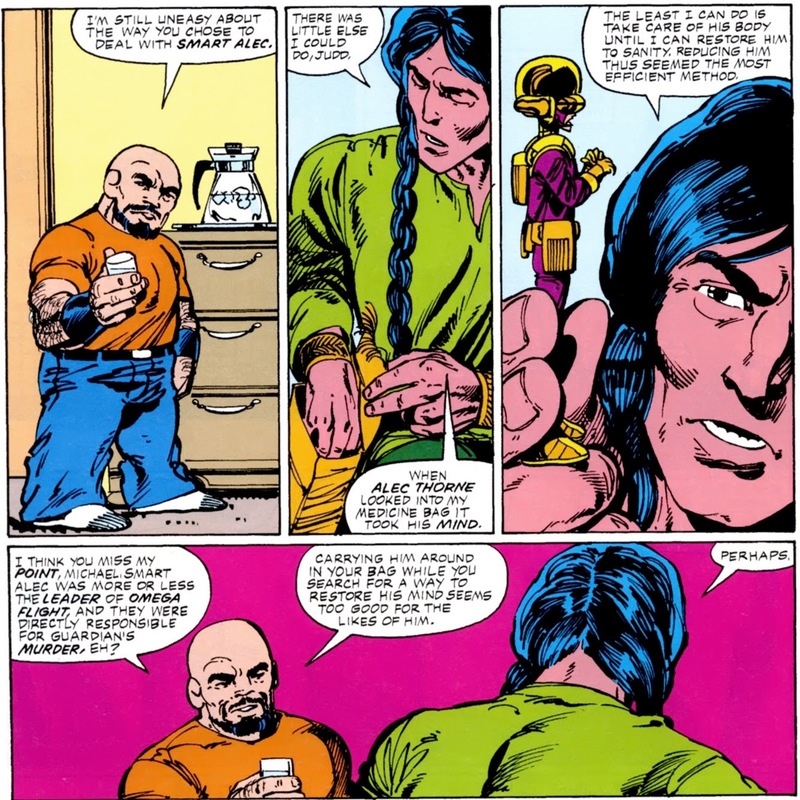 In many ways, Alpha Flight I#13 reads like a reboot. Guardian is dead, long live Guardian... Now what? Fans who were concerned about the team's survival without their leader got their first hint of what was to come when the trio of Shaman, Puck and Heather took the floor in #13. 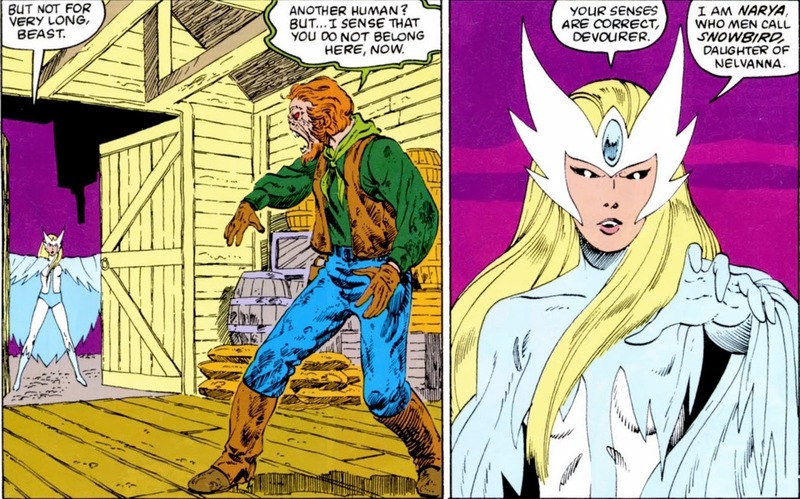 They would prove to be the nucleus of the new Alpha Flight, even if Heather herself tried her darndest to convince us otherwise in the closing pages of the thirteenth issue. Heather MacNeil Hudson isn't beaten yet"
Words to live by, though as the next issue proves... Steadfast dedication to heroic principles isn't without its own risks. 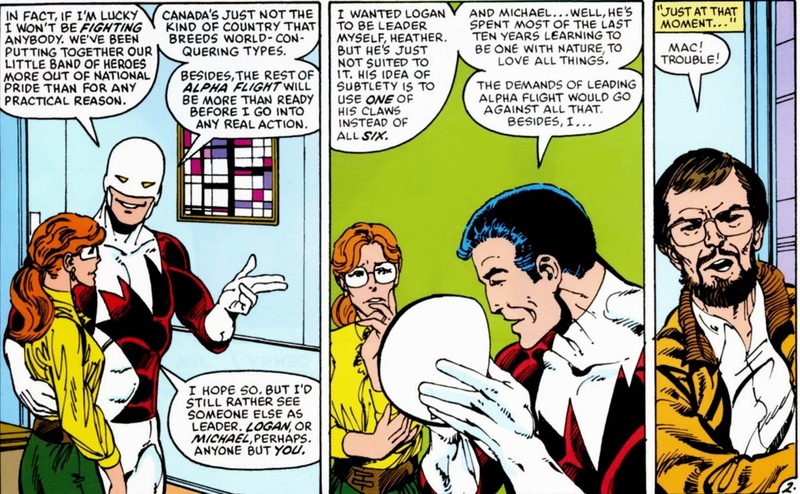 Alpha Flight I#14 opens with Heather and Puck visiting Ontario Place, a 1971 theme park built on three artificial islands in Ontario Bay that also houses the Cinesphere, the world's first IMAX movie theater (Wikipedia really is your best friend). During lunch, they are alarmed by the panicked shrieks of a nearby mother who claims "something" grabbed her baby, stroller and all, and dragged it into the bay waters. Heather wastes no time and dives in after the infant... But down in the deep, she encountered more than she bargained for. "Her legs. They've been ripped to shreds." Back in issue 2, Puck was the one who got injured when Marrina, the aquatic alien Alphan, tore his guts out... and now Heather suffers a similar fate. After getting her the necessary medical assistance, Eugene Judd calls in the one person he knows who can help him deal with an underwater threat. "Judd! I... did not expect it to be you after what happened..."
While looking for whatever injured Heather, not to mention the kidnapped baby and the 16 other people who had mysteriously vanished near Lake Ontario in recent weeks Marrina had suddenly reverted to the bestial state of mind she was in back in issue #2 when she gutted Puck like the trout she just swam next to. This time, the ultra agile Alphan was prepared for Marrina's merciless attacks, dodging her for a good while before this happened. "Stand back, ruffian! You risk much to seek to harm the chosen of Namor the First! Namor soon realized the error of his ways when he witnessed his blushing bride's brutal behavior first hand. 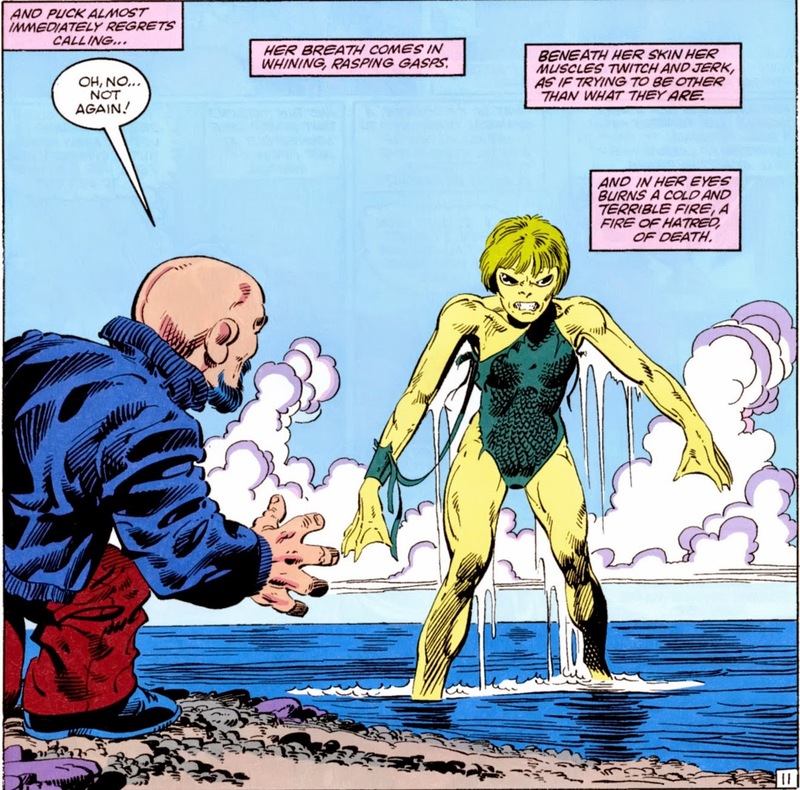 However, in the final pages of #15, both heroes and Marrina were incapacitated by the Master of the World, Alpha's returning main nemesis who would prove to be intimately involved with the murderous mystery of Lake Ontario. 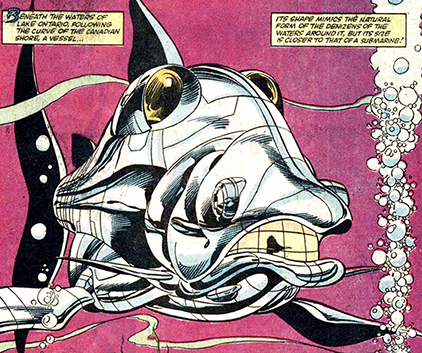 In issue #16, we join the Master of the World inside his fish shaped sub-marine parked on the bottom of Lake Ontario where he explains the plot to the trapped Puck and Namor. The Master thanks his impressive powers and technology to the Plodex, an ancient race of alien colonizers Marrina is a part of. The Master seeks to have Marrina meet another of her kind, the carnivorous monster threatening Lake Ontario though the reason why more than eludes me. The Plodex would conquer Earth, so why would one called the Master of the aforementioned world help bring about the subjugation of mankind? Eventually, Puck manages to save the day by using an old yoga technique to fake his death, leading the Master to open his cell to check on him. 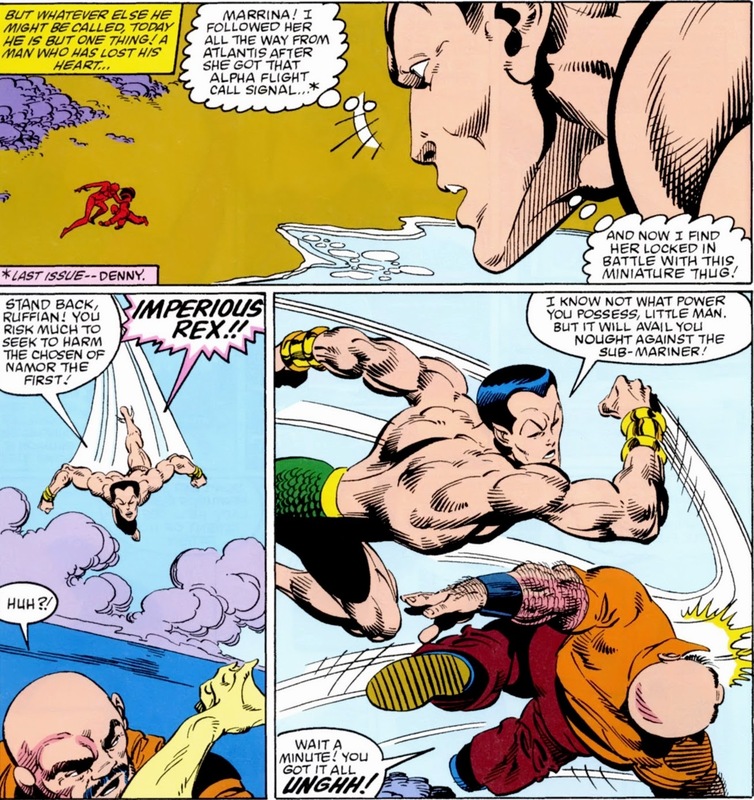 Puck then rips the villain's helmet off his head and uses it to help Namor break free out of his cage. 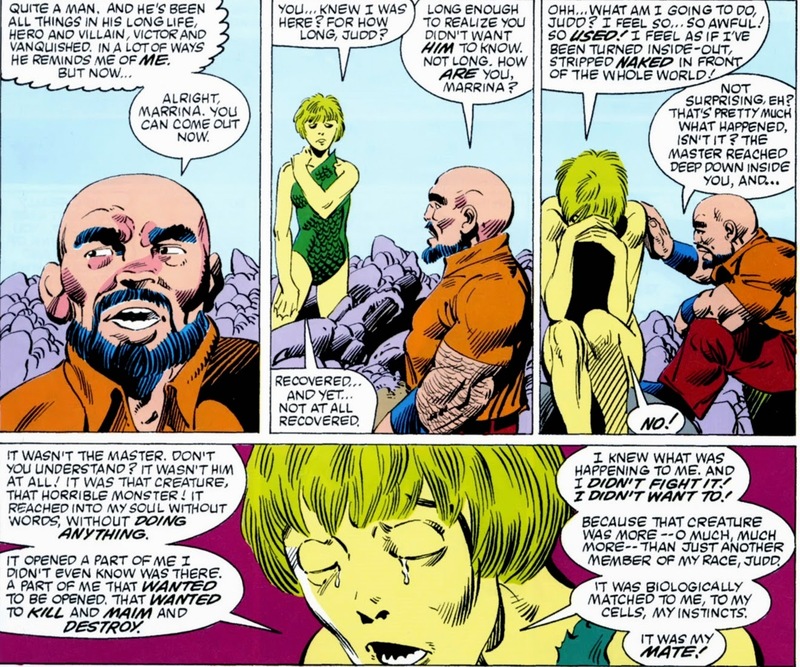 In the end, Namor is essential in bringing down the Master, his craft ánd the two Plodex lovebirds who the Master had already introduced to one another. The Sub-Mariner saves Puck and, on the shore of Lake Ontario, bids him adieu... mourning his lost love Marrina who might not be so lost after all. "Alright Marrina, you can come out now"
If only she had come out, then the threat of Plodex progeny could have been averted from the word go... Not to mention that "Plodex Progeny" sounds like an awesome k.d. Lang song. 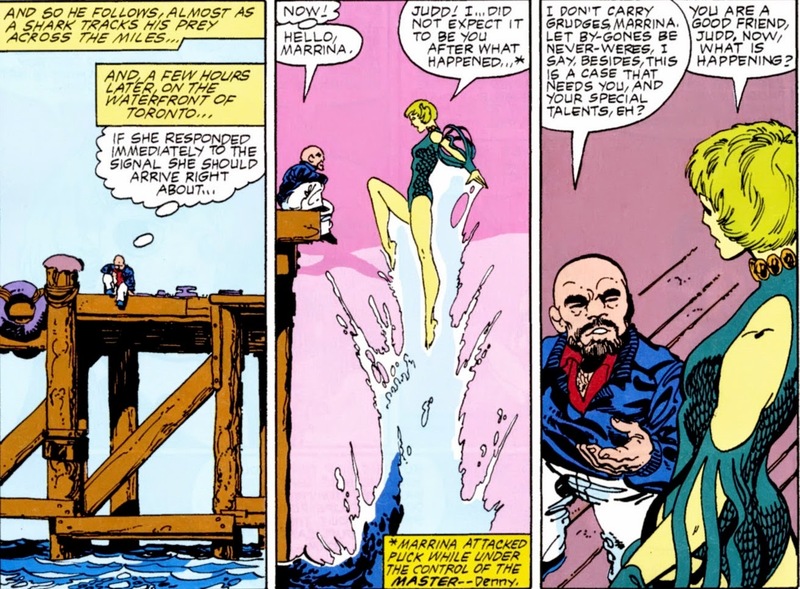 Marrina, crying salty tears, eventually heads back into the drink and out of Alpha Flight for good... determined to live a solitary existence, more than a little unaware she might already be with child (though that's a storyline left untouched until Walter Simonson took over Avengers after Roger Stern left in the late 80s). So, that's Puck, Marrina, Shaman and Heather... what of the other Alphans Sasquatch, Northstar, Aurora and Snowbird? 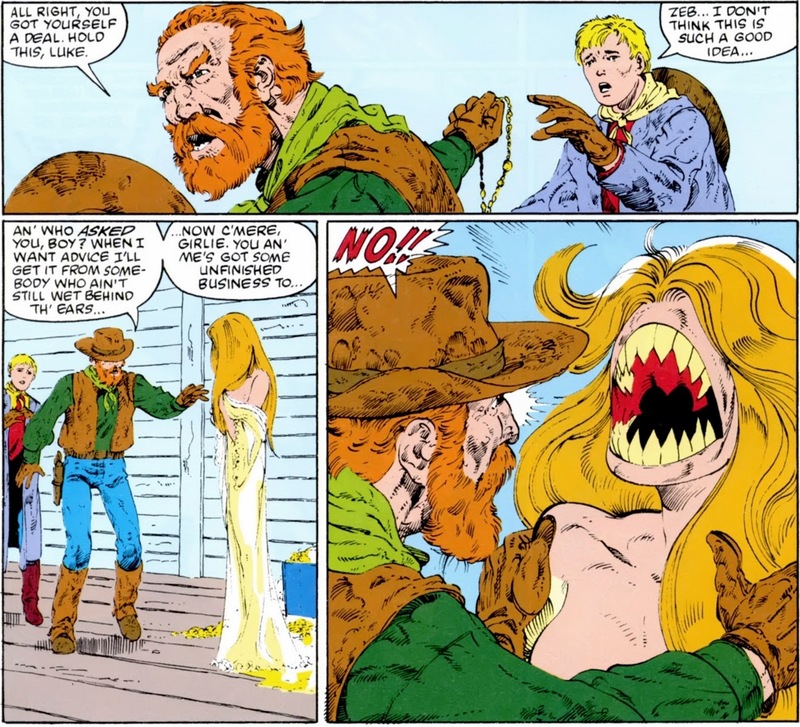 Well, issues 13 through 16 saw precious little of Sasquatch and the others only appeared in one page scenes that hinted at possible future storylines. So it's only fitting part I of Alpha's Beta Flight finishes up with a brief roundup... Starting with the severly schizophrenic Aurora desperately fighting a losing battle to preserve her sanity. 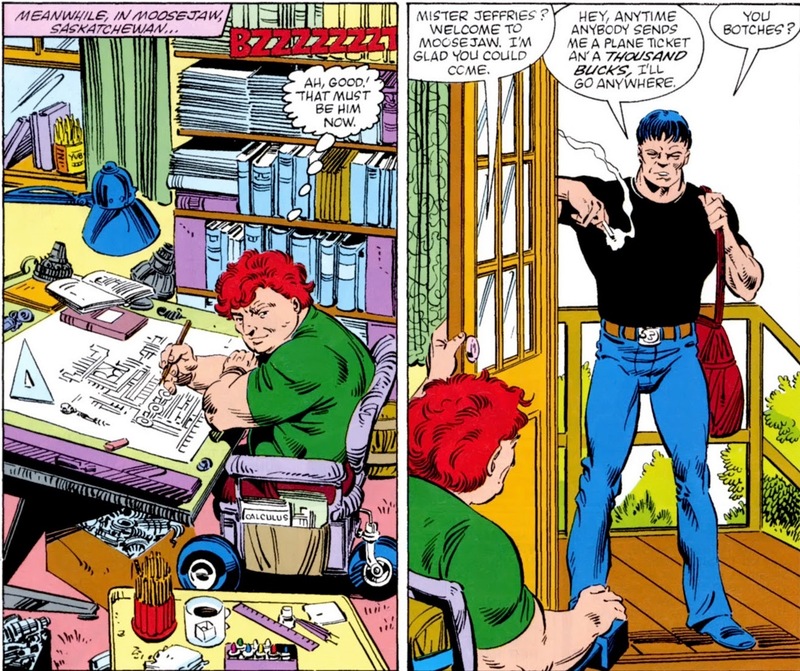 It's very easy and not entirely fair to compare John Byrne with his erstwhile collaborative partner Chris Claremont. Though, in all fairness, the similarities between the two creators and their characters are remarkable. 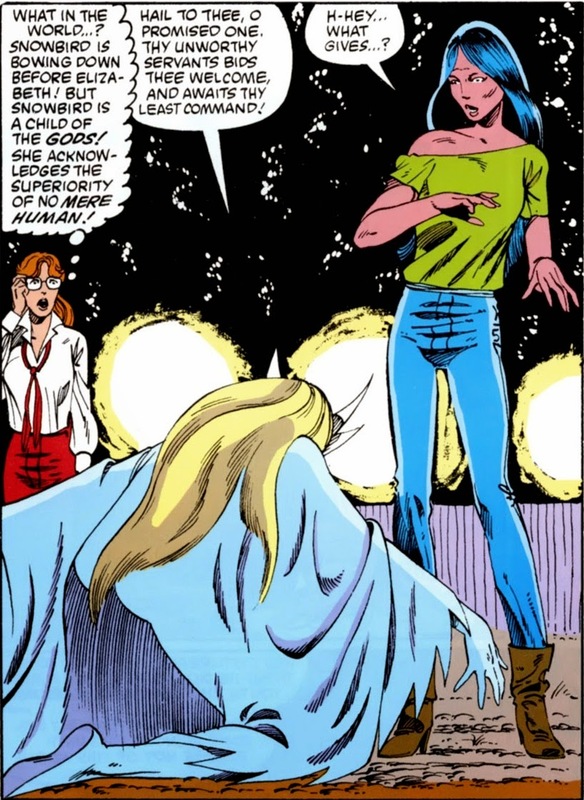 Take Aurora's schizophrenia for instance, that's more than a little reminiscent of the X-Man Rogue who struggled to keep control of her own mind after she accidentally absorbed Carol Danvers' psyche. Not to mention that both teams had wheelchair bound geniuses, gifted with technical skills that allow them to overcome any obstacle. 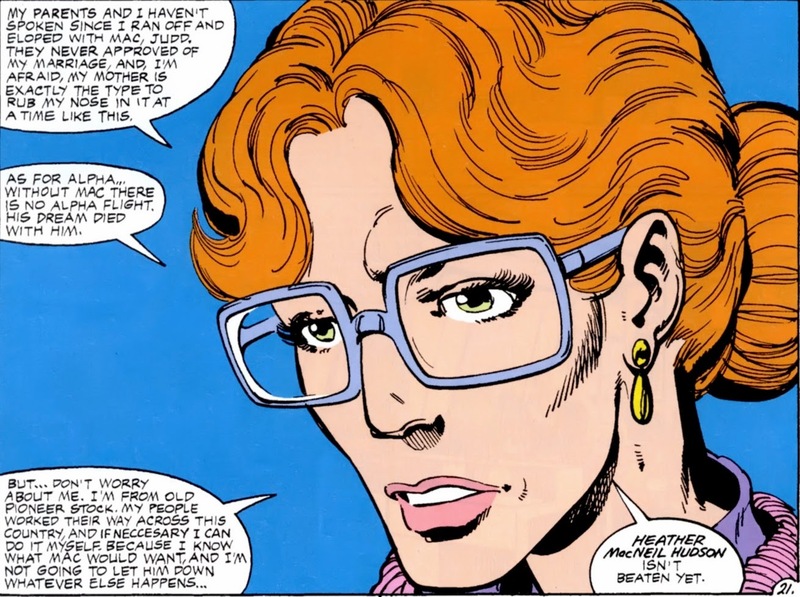 Roger Bochs was last seen when Delphine Courtney cont(r)acted him to join Omega Flight. His invention, the semi-organic robot Box was seized by Jaxon who used it to beat Guardian to a bloody pulp. It was that beating which caused Hudson's power pack to overload and that led Roger to feel at least partially responsible for his death. Incidentally, that's why he reached out to Madison Jeffries, another former Flight recruit capable of controlling metal. But we're getting ahead of ourselves here. Ah yeah, after almost dying because she'd left her sacred birthgrounds, the demi-goddess was forced to rethink her image. She always imagined herself a deity first, but this near death experience put things in perspective. Perhaps she was more human after all... And she decided to start exploring what it meant to be a woman with her colleague Doug. A fine choice, as we'll see before too long. But keep in mind... though she looks adult, it was only about six years ago that Shaman helped "Anne" be born. And speaking of children Shaman was instrumental in bringing into the world... meet Elizabeth Twoyoungmen, his teenage daughter who we last saw in Shaman's origin story where she was furious when he failed to cure her cancer stricken mother despite his promises. The woman died, which forced Elizabeth away from her dear old dad... and straight into adventures like this. Intriguingly enough, Elizabeth is able to identify both a person's race and gender just from looking at their half dug up skull. Quite a handy skill to have and as for that vengeful apparition, we'll cover that next time. Let's finish the way we started: the widow MacNeil Hudson and her friend Logan... the real one, though Heather decides to check just to make sure. "It's me Heather. Shaman told me about your nightmares." Probably not, but hey... even a broken clock is right twice a day. Speaking of which, time to wrap this up. Next time in Alpha's Beta Flight, the answer to who'll be leading the team... Oh, and not only will Shaman still be a horrible doctor... he'll be an even worse father to boot!